RETS Connector Monitor is an application that enables you to monitor the RETS Connector Scheduler service, and is automatically installed with RETS Connector. How you open RETS Connector Monitor depends upon your operating system. In Windows 7, click the Start button on your computer desktop and select All Programs >> RETS Connector >> Monitor. When you minimize the RETS Connector Monitor, its icon may be removed from your computer desktop’s task bar, but remains in the system tray. Double-click the icon to restore the application window. 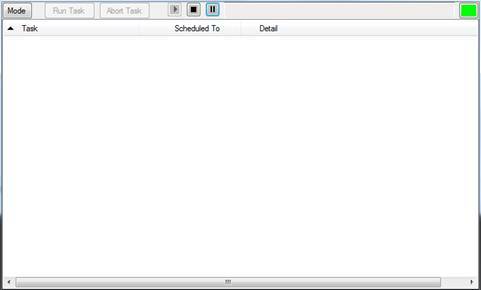 When a task is running in the scheduler, the icon will move. 1. Click the Mode button. 1. In task mode, click a task name to select it. 2. Click the Run Task button. 2. Click the Abort Task button. You must have administrator privileges on your computer. Click the Start ( ), Stop ( ), or Pause ( ) button.